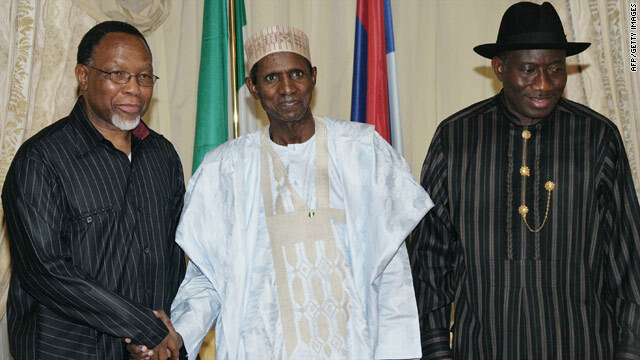 Nigerian president Yar'Adua (center) in the Presidential Villa in Aduja on November 13, shortly before he left Nigeria for treatment. Lagos, Nigeria (CNN) -- Nigeria's ailing president has broken two months of silence to assure his countrymen that contrary to speculation he is alive and intending to return to power soon. President Umaru Musa Yar'Adua this week gave his first media interview since being admitted to a hospital in Saudi Arabia in late November where he is being treated for acute pericarditis, an inflammation of tissue around the heart. His absence has created a power vacuum in Africa's most populous country, as Yar'Adua has not formally handed his presidential duties to Vice-president Goodluck Jonathan. In a phone interview with the BBC from his hospital bed Tuesday, President Yar'Adua said he was recovering from his treatment. "At the moment I'm undergoing treatment. I'm getting better from the treatment. I hope that very soon there will be tremendous progress to allow me to get back home," he said. "As soon as my doctors discharge me I'll return to Nigeria to resume my duties," he added. Yar'Adua's interview coincided with demonstrations in the nation's capital, Abuja, where protesters demanded a constitutional order on his absence and "evidence about his true state of health," Voice of Nigeria reported. The Nigerian Senate is seeking also information on the president's whereabouts and health. Video: Where is Nigeria's president? It passed a resolution Tuesday asking Nigeria's "secretary to the government of the federation" to brief it on Yar'Adua's status, Voice of Nigeria reported. The Senate had earlier considered sending a delegation to Saudi Arabia. "In arriving at its decision, the Senate expressed concern that there had been no formal communication to the National Assembly" -- as required by the nation's constitution -- "(to) empower the vice president to act and perform the functions of the president," Voice of Nigeria reported. Some senators also pushed for an amendment to a law stating that a presidential letter to the National Assembly about an absence is optional, the news organization reported. Foreign Minister Ojo Maduekwe told CNN he has not spoken to Yar'Adua since he left for Saudi Arabia. But he also said he has no need to talk to the president while he is recovering. Yar'Adua's illness was diagnosed in November after he complained of chest pain following prayers at a mosque in Abuja. He was taken to King Faisal Specialist Hospital and Research Centre in Jeddah, where he had his last checkup in August, his doctor said. He said at the time he did not intend to resign while in Saudi Arabia. In addition to internal discord over its missing president, the oil-rich nation has faced some international heat after one of its citizens allegedly attempted to blow up a U.S.-bound flight on Christmas Day. Nigeria was then cited as a country from which enhanced security measures would be enforced for passengers on U.S.-bound flights. A senior U.S. administration official said Nigeria fell into the U.S. Transportation Security Administration category of "state sponsors of terrorism or other countries of interest." Another notable worry for the government is its handling of militants who have wrestled with the government over oil. On Tuesday, police announced that four Shell contractors had been abducted. Hundreds others have been kidnapped over recent years.